What began as a low-key game to help parents pass the time during their kids’ after-school activities turned into an international phenomenon that has been recognized in the United Nations. Each week, when Ofra Abramovich took her daughter to ballet class, she would find herself turning down an invitation from a fellow mother to join a weekly game of “catchball,” a volleyball-like game that residents of her hometown of Kfar Saba had started to play at a local gym. That was 11 years ago, and it was one of the best decisions Abramovich ever made. Thousands of women from across Israel are now gathering twice a week for catchball games as part of a league called Mamanet, which Abramovich began to organize after her friend persuaded her to play more than a decade ago. Mamanet teams are usually based in the schools attended by the players’ children, and all games are local, making participation convenient and accessible for mothers. As a result of its success, the Mamanet model has begun spreading around the world, and has attracted the attention of health researchers, who say it has become a tool for strengthening families, as well as building communities and fostering relationships between them. “It’s more than a sports league, it’s also a platform for advancing social causes and community initiatives,” Nizar Amer, counselor for economic and social affairs for Israel’s delegation to the United Nations, recently told the General Assembly in New York before it unanimously passed a resolution reaffirming that sports bring about positive social change and build a peaceful and better world. Israel was one of 67 countries that sponsored the resolution, and Amer spent the better part of his presentation talking about Mamanet and its effects on Israeli society. Abramovich, now 51 and a mother of teenagers, never could have imagined this back in 2005 when she recruited 50 women, organized into teams based on their children’s schools, to play weekly games at a local gym with some of their husbands serving as coaches. “But Mamanet is a platform for all mothers, to achieve any dreams that they have,” she says. Catchball, also known as Newcomb ball in the United States, was developed in 1895 by physical education instructor Clara Baer, who taught at H. Sophie Newcomb Memorial College, which was then the women’s division of Tulane University in New Orleans. Baer, who wrote the first rules for women’s basketball and introduced the first physical education certification programs in the American south, initially developed catchball for her students to practice ball-handling skills for use on the basketball court. The game consists of two teams standing on either side of a gym, facing each other. One team attempts to throw a ball toward the other team that cannot be caught before it hits the floor. If the ball hits the floor, it’s called a touchdown and the team that threw it scores one point. Baer quickly realized that catchball could be a game in and of itself, one that up to 40 people could play at once with minimal equipment. So it became part of Newcomb’s curriculum, and quickly spread across the country, becoming the second-most played women’s sport—after basketball—at high schools and colleges. Soon, a net began to be used to divide the two teams on the court, and specific rules were written governing court size, number of players, length of games, etc. It was considered very much a women’s game, while volleyball, invented around the same time in New York, was seen as a men’s game. Volleyball, which became an Olympic sport, eventually eclipsed catchball, which by the 1950s had faded in popularity, limited mainly to elementary school gym classes as an introduction to volleyball. This long-forgotten game was introduced to Israel in 1986 by Haim Borovsky, a physical education teacher who emigrated from Argentina, where the game, called cachibol in Spanish, was commonly taught. He began teaching it to groups of women in Nazareth Ilit, where he lived. “It’s an easy game and when children see their mothers play, it’s an example of good sportsmanship,” says Borovsky, now 82. When he moved to Kfar Saba in 1998, he taught the game there as well. It grew in popularity in Kfar Saba, then began to spread around Israel through Mamanet and other leagues. Although Mamanet offers a unique infrastructure for playing the game, many other leagues have been organized through workplaces, according to the Catchball Association, which was formed in Israel in 2009 to expand and promote the sport there and abroad. It started out in Kfar Saba and now has chapters in North America and Europe. This summer, the sport will be part of the Maccabiah Games—an international sports competition in Israel commonly known as the “Jewish Olympics”—for the first time. It was amid this growing popularity that Abramovich sought to organize a program to make it accessible to all mothers. 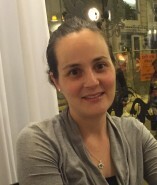 Shortly after encountering the game in 2005, she got to work organizing a league in her hometown of Kfar Saba. 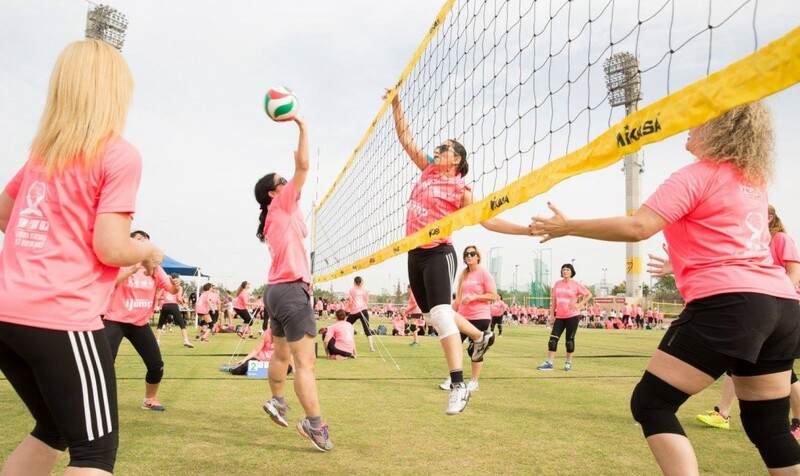 Within three months, more than 200 women were participating, and the game spread quickly to other towns, where older women, who had relatively few opportunities to participate in sports, welcomed the new program amid growing awareness of sports’ long-term physical health benefits. The way Mamanet is structured also fits in well with many mothers’ schedules, with all games being local, eliminating the need for commuting or travel, and teams based on the schools that the player’s children attend. “It’s very easy to build it,” Abramovich comments. Several of their children attend the games and practices, helping to keep score and cheer on their mothers. The games are fun, but also well-organized, with each team wearing matching shirts with their names on the back, and a judge atop a ladder at the end of the net carefully watching for when the ball goes out of bounds or hits the ground. 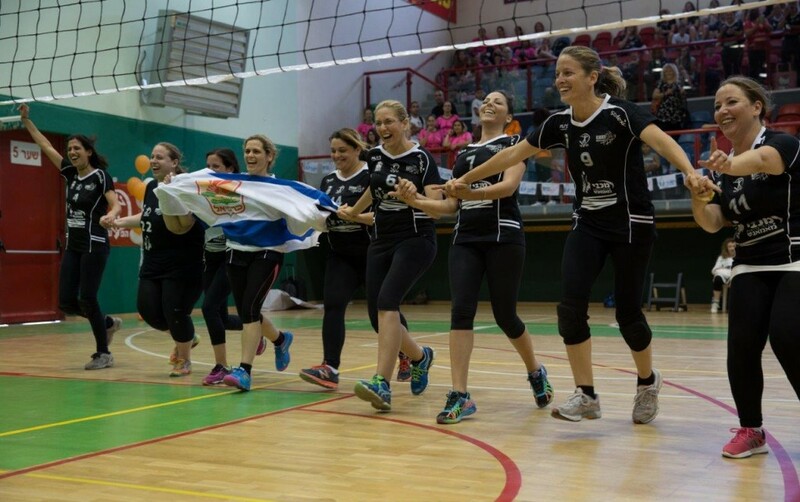 Eliav’s teammate, Hagit Klaiman, also 49 with three children, says that in addition to providing physical activity and relaxation for mothers, it makes her feel part of a community. “If I didn’t have this, I wouldn’t know any of these moms, even though our kids go to the same school,” Klaiman stated. “We all just drop our kids off at school then rush to work.” The monthly school newspaper publishes updates about the Mamanet team, something Klaiman’s nine-year-old son, Yaron, appreciates. “I really like to see them play, it’s fun,” Yaron says. In recent years, Mamanet has expanded to frameworks outside of schools. The organization has helped implement programs for women in jails and at-risk youth in boarding schools. It has also spread beyond Israel’s borders, with leagues in the United States, Italy, Austria, Switzerland, and Cyprus. An international tournament in Spain last year brought together 200 players, and Mamanet recently joined the International Workers and Amateurs in Sports Confederation, which is based in Vienna with chapters and activities all over the world. Monica Zibellini of Rome first encountered Mamanet at the Confederation’s annual World Sports Games in June 2015, where she participated in an exhibition match of catchball. Zibellini and others started a league in Italy, and there are now teams in Forli, Florence, and Rome, as well as periodic training courses around the country. Mamanet has also attracted the attention of health researchers, who are studying how the league changes the lives and well-being of women and their families. A joint project by the University of Haifa and Ariel University will interview 500 mothers over three years to try to quantify how participation in Mamanet affects their physical health as well as their social networks and support systems. “This activity has much more benefit than physical activity,” says Riki Tesler, a professor in the Department of Health Systems Management at Ariel University, who is coordinating the research project. “It seems to influence the whole family, and every social circle around the women who participate.” Tesler claims Mamanet is a unique combination of a sport open to all and a competitive framework that enhances leadership and unity. This is the first time that Israel seems to be exporting an athletic activity, Zimerman says. Catchball, she feels, is filling a growing need, especially among women, for accessible and fun athletic activity. “The sport really deserves more attention,” Zimerman comments. She hopes its inclusion in the Maccabiah Games will give it a boost globally. Both Zimerman and Abramovich say that Israel’s connection to the Jewish diaspora has helped spread interest in catchball, with many Israelis moving abroad and taking the game with them. From there, it has spread into general society.